A round of mini-golf and a few swings in a batting cage make for a fun day or evening with the family, friends or that someone special. There are 2 18-hole courses to choose from: Fantasy Land and The Land of New England. Last golfer goes off 30 minutes prior to closing time. There are 9 cages to choose from ranging in speed from Major League fastball to slow-pitch softball, you should be able to find one that suits your swing. A waiver is required for the Batting Cages. Be sure to fill out your waiver before you arrive to save time. You can fill out the online waiver HERE. 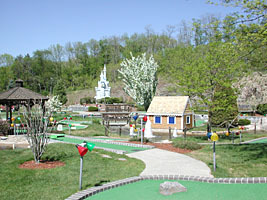 Play a second round of Mini Golf - Receive $1 off. Includes admission to SkyWalk, 1 round of mini-golf, and 3 batting tokens. Includes admission to the SkyWalk Ropes Course, 1 round of mini-golf, 1 hour of MAZE play, and 1 batting token.